The Indigenous Academic Support Unit (IASU) recently held a well attended BBQ lunch for students and staff. The BBQ provided a great opportunity for Indigenous students and staff to have a little ‘down-time’ together as well as unleashing their creative talents later to decorate the concrete tables and seats under the expert tutelage of Indigenous Academic Support Lecturer and gifted artist, Kathy Arbon, in the recently constructed veranda area at Building 30. The IASU also invited the Australian Electoral Commission to set up an information booth to provide assistance to Indigenous students to update their enrolment details. This was particularly useful for students who have recently turned 18 and have left school to come to uni, as well as those who have travelled in from other locations to live in Darwin to study. 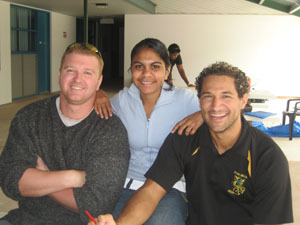 The Australian Electoral Commission arranged for Indigenous Cadet, Kerri Davidson, to set up the stall and provide assistance to her fellow students. Kerri completed the CDU Indigenous Pre-Arts/Law program several years ago and is now midway through a double degree in Law/Arts.